The dangers of nuclear testing began even before the bombs were dropped. Navajo miners in Monument Valley experienced similar symptoms to those exposed to fallout in other areas of the West. A critical component to building atomic weapons is vanadium, an element that is also radioactive. 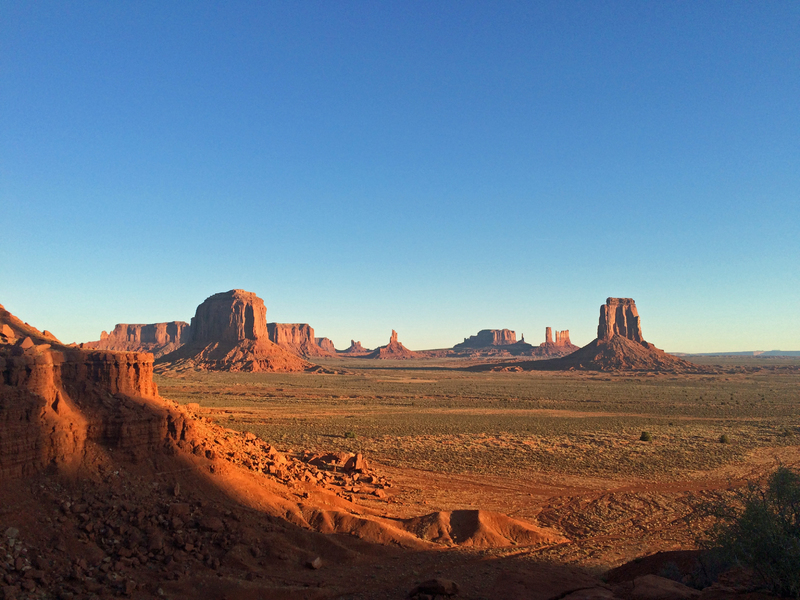 One area with vanadium in plentiful amounts is Monument Valley on the Utah-Arizona border within the Navajo Nation. 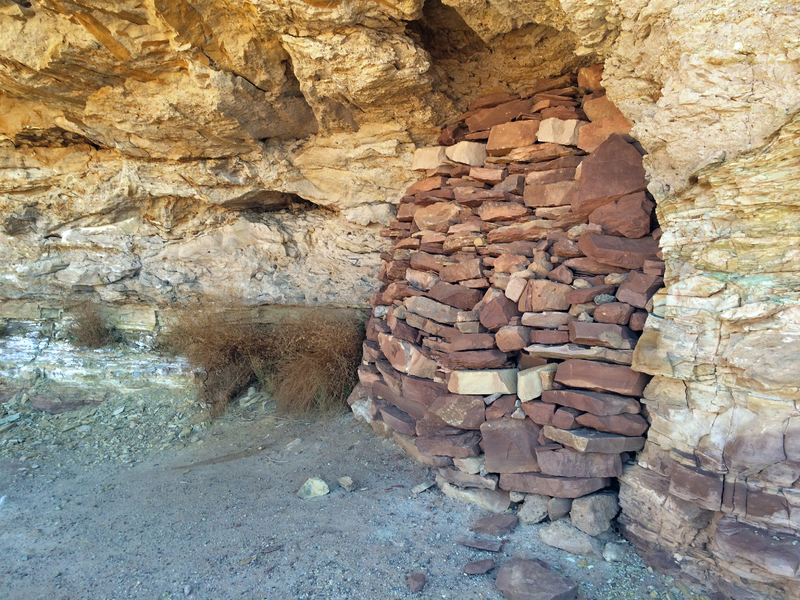 Recognizing the opportunity for jobs, the Navajo people took on the task of mining the substance and were exposed to the radiation that would become familiar to many in the west. 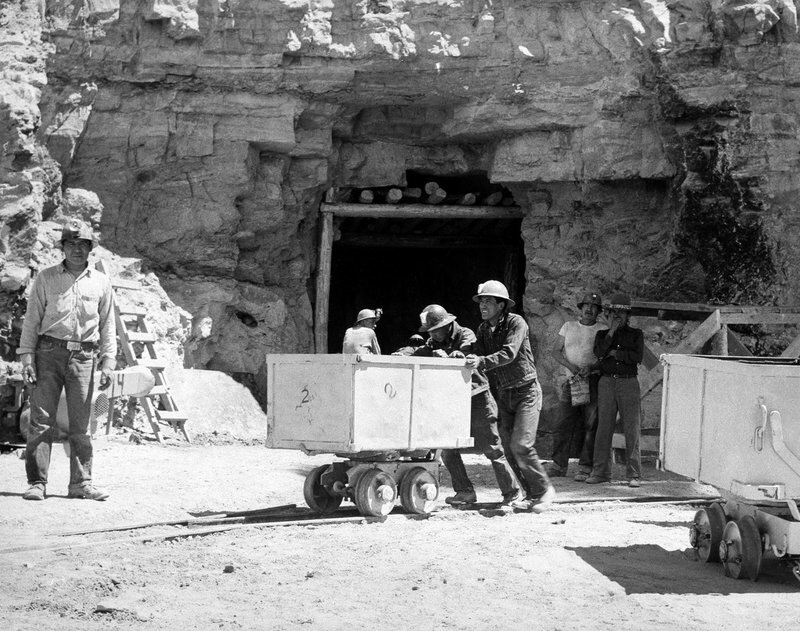 In the 1940s, the Vanadium Corporation of America (VCA) and other organizations petitioned the Navajo Nation for the right to mine on their land. The rights were granted with the stipulation that the jobs go to Navajos themselves and the grazing land be as undisturbed as possible. One young man named Luke Yazzie heard that there were men willing to pay for a particular kind of rock. He knew where to find the rock so he contacted John Wade of the VCA and led him to an area he often played in as a boy. A sample from the area determined that it was rich with vanadium. It came to be known as Monument No. 2, one of the largest producing vanadium mines in Monument Valley. Previous research with uranium mining in Europe taught health officials the risk of lung cancer when mining radioactive materials. Uninformed of the danger, Navajos worked in unventilated conditions and brought the dust home with them. One worker, George Brown, later recalled, “We brought a lot of that stuff home. We never knew it would affect us down the road.” As time passed, many had strange, unexplainable health problems. Family and friends began dying. They began to point to the mines as the cause. Harry Tome was one individual who knew he needed to do something. He contacted newspapers and, despite his efforts, little to no attention was paid to his cause. Miners were dying from the effects of radiation because they had not been warned of the dangers by their employers or the Public Health Association. Investigations into the issue by Congress showed that they knew the dangers, but had not acted in the interest of the Navajo people. It would be years later, when the issue grew in the nation, that his effort would gain momentum. 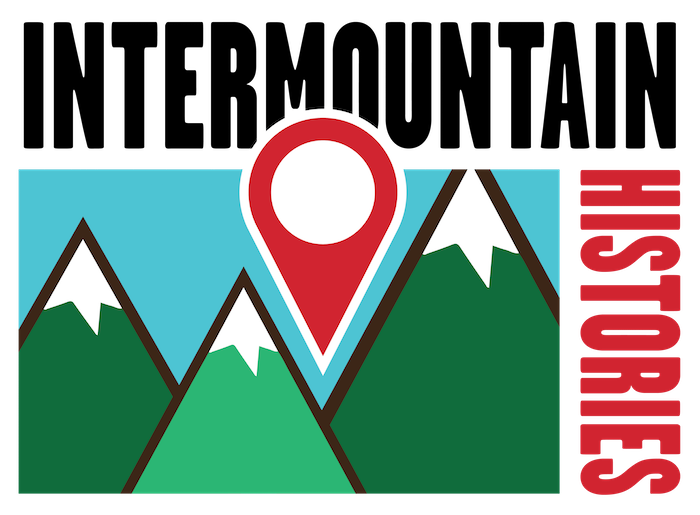 After several years, Tome contacted Secretary of the Interior Stewart Udall. Udall was from the area and knew the Navajo people. With his help and more years of continuous effort on the part of the Navajo people, a bill passed through Congress. The Radiation Exposure Compensation Act of 1990 required that $100,000 be paid to miners suffering from radiation exposure and that if they were deceased their families should receive the money. The bill may be considered a victory for the community, but it is also important to remember the time and work that preceded it. Their story is a reminder of the importance of occupational safety and that every community’s safety be a governmental priority. Navajo Miners ~ Source: Morales, Laurel , from NPR. “For The Navajo Nation, Uranium Mining's Deadly Legacy Lingers,” available at https://www.npr.org/sections/health-shots/2016/04/10/473547227/for-the-navajo-nation-uranium-minings-deadly-legacy-lingers. Index Map of Monument Valley Showing the Location of the Early Cornotite Leases ~ Source: Chenoweth, William L. “Early Vanadium Uranium Mining in Monument Valley, Apache and Navajo Counties, Arizona, and San Juan County, Utah.” Tuscan: Arizona Geological Survey. Available at http://repository.azgs.az.gov/sites/default/files/dlio/files/2010/u14/ofr_85_15.pdf. Emily Cook, Brigham Young University, “Navajo Vanadium Miners in Monument Valley,” Intermountain Histories, accessed April 19, 2019, https://www.intermountainhistories.org/items/show/166. Brugge, Doug and Rob Goble. “The History of Uranium Mining and the Navajo People,” American Journal of Public Health (September, 2002). 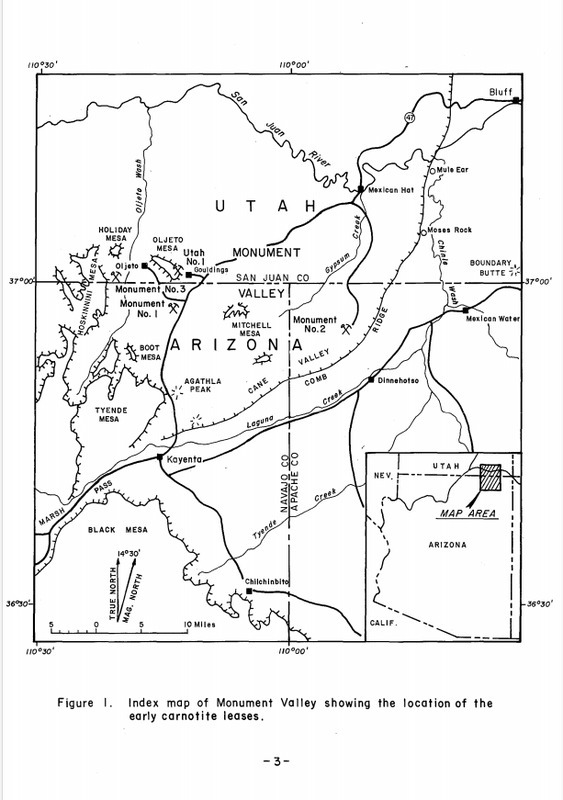 Chenoweth, William L. “Early Vanadium Uranium Mining in Monument Valley, Apache and Navajo Counties, Arizona, and San Juan County, Utah.” Tuscan: Arizona Geological Survey. Available at http://repository.azgs.az.gov/sites/default/files/dlio/files/2010/u14/ofr_85_15.pdf. Eichstaedt, Peter H. If You Poison Us: Uranium and Native Americans, Santa Fe: Red Crane Books, 1994. “Dr. Archer Takes Mine Health Post” Times Independent (Moab, UT), August 2, 1956. Available at https://newspapers.lib.utah.edu/details?id=20335317&q=uranium+miners+radiation&date_tdt=%5B+1956-01-01T00%3A00%3A00Z+TO+2003-12-31T00%3A00%3A00Z+%5D. “Free Medical Exams Await Uranium Miners during 1960.” Times Independent (Moab, UT), June 8, 1960. Available at https://newspapers.lib.utah.edu/details?id=20365610&q=uranium+miners+health+study&date_tdt=%5B+1947-01-01T00%3A00%3A00Z+TO+2001-12-31T00%3A00%3A00Z+%5D. Salt Lake Times. “Health Vigilantes Protect You Against Enemies,” April 14, 1961. Available at https://newspapers.lib.utah.edu/details?id=13309629&q=uranium+miners+health+study&date_tdt=%5B+1947-01-01T00%3A00%3A00Z+TO+2001-12-31T00%3A00%3A00Z+%5D. “Miners Given Examinations” San Juan Record (Monticello, UT), August 16, 1951. Available at https://newspapers.lib.utah.edu/details?id=9813976&q=uranium+miners+health+study&date_tdt=%5B+1947-01-01T00%3A00%3A00Z+TO+2001-12-31T00%3A00%3A00Z+%5D. Times Independent. “Uranium Miners May Have Free Medical Exams by Public Health," May 16, 1957. Available at https://newspapers.lib.utah.edu/details?id=20398192&q=uranium+miners+health+study&date_tdt=%5B+1947-01-01T00%3A00%3A00Z+TO+2001-12-31T00%3A00%3A00Z+%5D. Times Independent. “Uranium Mine Peril Small Commission Head States,” July 7, 1957. Available at https://newspapers.lib.utah.edu/details?id=20399147&q=uranium+miners+radiation&date_tdt=%5B+1956-01-01T00%3A00%3A00Z+TO+2003-12-31T00%3A00%3A00Z+%5D.